Editoria is the open source, browser-based books workflow production system built in the PubSweet community, part of the Coko family. It is also a community that is home to the most forward-thinking of books folks. Editoria was born out of the desire to finally leverage the power of the web within books workflow. This meant breaking free from desktop-based workflows. This meant leveraging the benefits of HTML first workflows. Some organizations come for the possibility of browser-based author/editor collaboration à la google docs, but optimized for scholarly publishing. Some come for the HTML first workflow. What really sparkles the eyes, and I think why they stay, is for the automated typesetting. Today, once content is converted from .docx to HTML, structured semantically, and through editorial workflow, it can be exported as an EPUB or to PDF with just a couple of clicks. Using Paged.js, the prepared HTML is rendered as a paginated preview of the PDF output by applying CSS Paged Media rules on screen. The best part, and what really inspires big reactions in demonstrations, is the ability to interact with the CSS within Paged.js. The Editoria interface enables making CSS updates, such as changing text color, to a book’s theme and then watching the paginated output update to the new styles in place. This is possible thanks to both Editoria and Paged Media having committed to building publishing tools with web browser technology at the core. 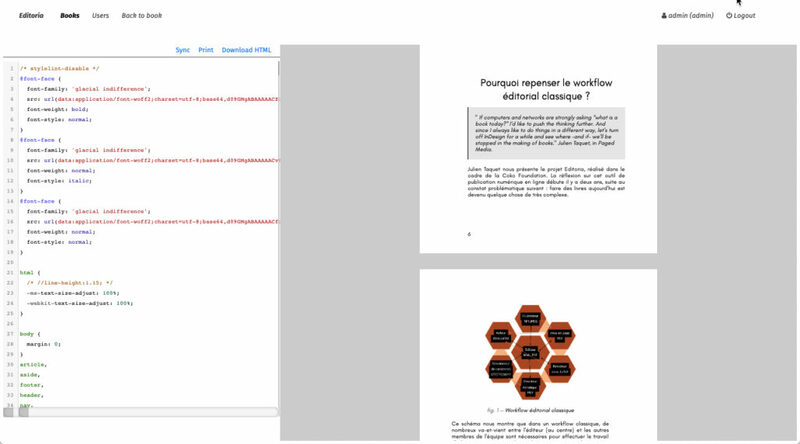 Once all CSS updating is finalized, Paged.js can generate a PDF ready to be taken to the printer. Automated typesetting was the promised land – if it could be made real, it could mean cost and time savings in workflow. As the community was founded by university presses and library publishers, these savings would create very meaningful efficiencies. For example, a press could publish more books, better books, could explore new possibilities, if no longer strapped for time and cash. That’s the status of Paged.js in Editoria today. Tomorrow, the possibilities are unlimited. You can imagine how this creative community are iterating on this functionality in our open feature proposal process. They have proposed ideas such as CSS template libraries, extended dashboards for multi format export, adding a backend server for PDF generation, and many others. We’ve achieved cross-pollination of the Paged Media and Editoria Communities, with Paged Media’s Fred Chasen and Julie Blanc attending and presenting at the first Editoria Community Meeting in San Francisco, after which there was an optional Paged Media workshop day held. Similarly, when Paged Media held workshops in Paris this fall, a warm invitation was extended to the Editoria Community. Paged.js will play a central role at our upcoming Community Meeting in San Francisco. Paged.js speakers are on the program, and we are sure that extending the integration will be on the minds of attendees during our feature proposal brainstorming process. If you’d like to attend this meeting, please feel welcome! We’d love to have you!